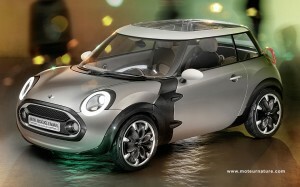 I’m a great fan of the original Mini, the one which dates back to 1959. I kinda like the newer ones, but I always think they’re just too big compared to the first model. So it was great news to learn that Mini was going back to its roots: it will unveil a concept of a smaller model at next week Geneva’s show. Yet, that concept won’t make any breakthrough. It’s 135 inches long. 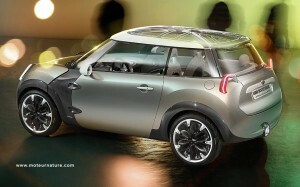 True, that’s one foot shorter than the standard Mini, but 14 inches longer than a Toyota Iq. I was expecting more. I mean less, a shorter car! 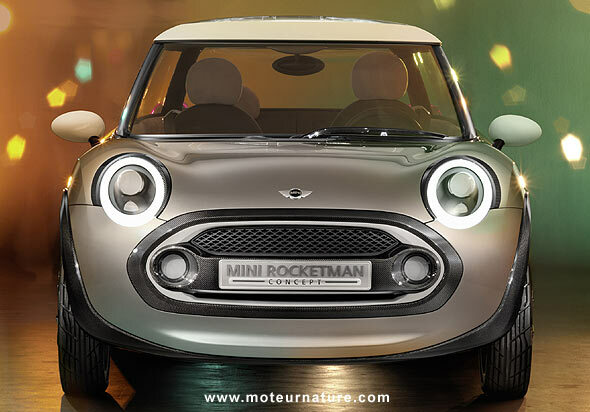 It’s even more of a disappointment that this Rocketman Concept (could a teenager be in control at Mini, to choose that name?) isn’t a true 4-seater. Much like the Iq, the right rear passenger only has space for his legs because the front passenger has its seat a few inches forward of the driver’s seat. Someone trying to sit behind the driver would not be so lucky. I would like to enjoy this concept, and I’m a big fan of those big LEDs lights, the external door hinges look cool too, but someone made a mistake when they chose to use 18″ wheels. I guess many people think that the bigger the wheels, the better the car. I see cars with 21″, or even 22″ wheels, this is madness! Nobody needs this to drive on the streets. Especially on a small car. The original Mini, in 1959, had 10 inches wheels. I know that sounds incredible today, but those wheels and compact rubber cones instead of conventional springs for the suspension, were the innovative solutions that enabled the 1959 Mini to accept 4 people inside despite its smallish exterior dimensions. I wish this Rocketman concept could be closer to that original model. With smaller dimensions, it’s trying, and innovative technologies too, it’s not.